Johns Creek has been embroiled in Cyberbullying, with finger pointing from Elected Officials recently. Mayor Bodker even threatened to sue unknown residents who post Factitious satirical vulgar commentary on Facebook, about him. The Johns Creek Post has nothing to do with this person or any influence or control over what is on the Facebook platform. 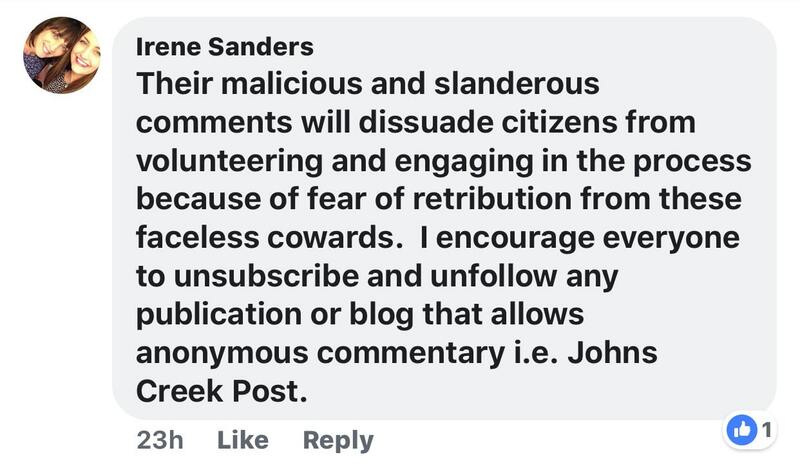 The Johns Creek Post (JCP) remains steadfast against Cyberbullying on its own website, by monitoring the comments prior to approving. We do not allow malicious and vulgar commentary. Most comments are opinions and feelings expressed about the issues, which everyone is entitled to. The use of technology to harass, threaten, embarrass, or target another person. Cyberbullying remains close to the Johns Creek Post owner’s heart, as she has been bullied and bashed by Elected Officials & Appointed Committee members, for over a year, and even most recently. As a Mother of 4 school-age children and business owner, it is difficult enough to maintain and grow a business while juggling demands of work and life. The Johns Creek Post is a legitimate, tax-paying business and is registered with the Georgia Secretary of State. As a resident whose day-to-day life encircles Johns Creek, I see the impact of the decisions made by our Government. Having Elected & Appointed Officials (& Spouse) effectively calling on the public to boycott your Business is not only unprofessional, but it is also mean and disparaging. 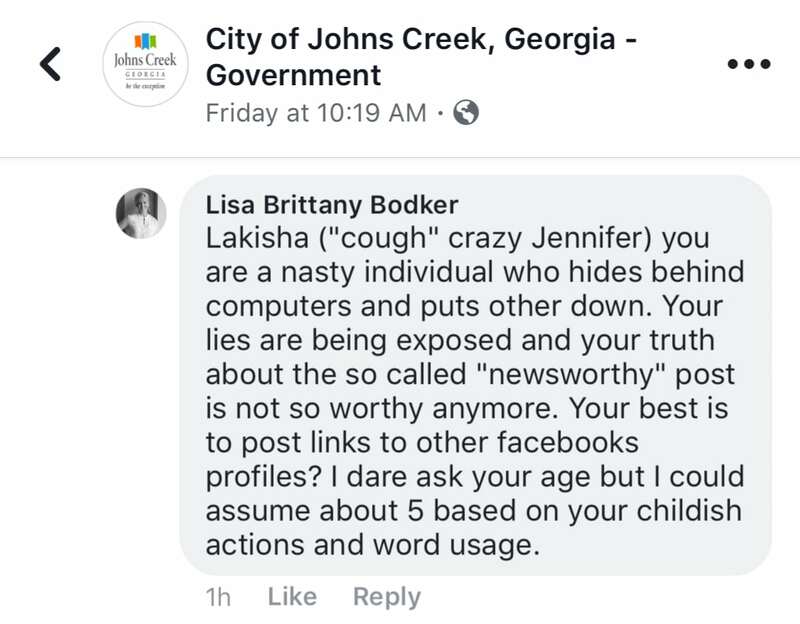 The Mayor's wife, Lisa Bodker accused Jennifer Jensen of being another person (Lakisha) which is PATENTLY FALSE. This comment was posted on the City of Johns Creek Facebook page, and mysteriously disappeared from the archive (which the City is required to keep), despite multiple Freedom of Information Act Requests. These comments below (from Planning Commission Appointed Board member) and are sourced from Lenny Zaprowski’s recent Facebook post proclaiming he doesn’t Troll the Johns Creek Post website. 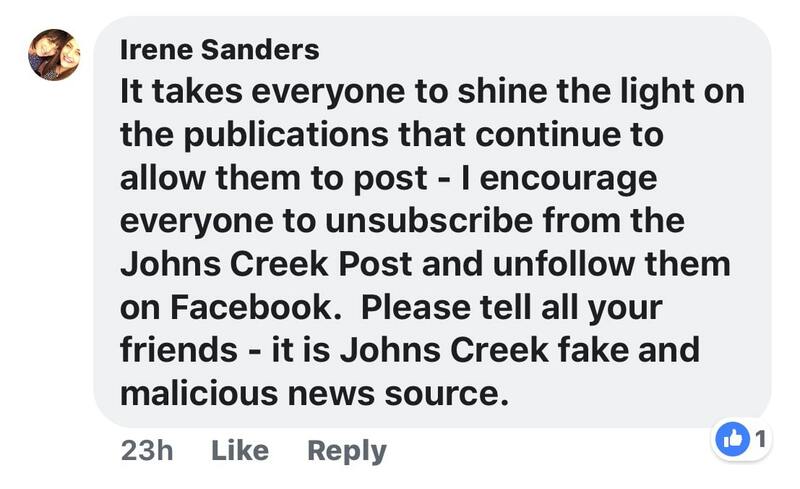 While the attacks in public, continue, we have also been made aware by past advertisers and prospective advertisers NOT to associate with Jennifer Jensen or the Johns Creek Post or they will have negative consequences. Is this not the very essence of bullying? 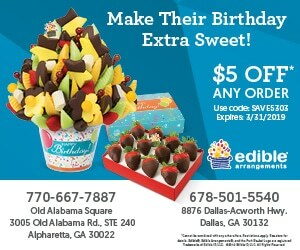 Everything published is sourced from public records, the majority from the City of Johns Creek itself. If anyone has an issue with the information we source from the City of Johns Creek, the issue is with the City. When we were accused of Lying about Rezoning of Dean Gardens, we published the audio from the Zoning Hearing & Vote. When we were threatened with Legal Letters from the Atlanta Athletic Club, regarding our post about the AAC’s desire for Mixed Use, and the FACT Planning Commission Voted to Recommend the Mayor & Council consider the request, we published the video. We cannot control the decisions of our Elected officials. However, we do have the right to review, discuss, and debate the decisions within the public forum. If Elected officials do not like this discussion, then we would suggest rebuttals rather than personal attacks. It is time to Stomp Out Bullying in City Hall, and for our Elected & Appointed Officials to behave in an ethical, respectable and professional manner to ALL Residents & Businesses. 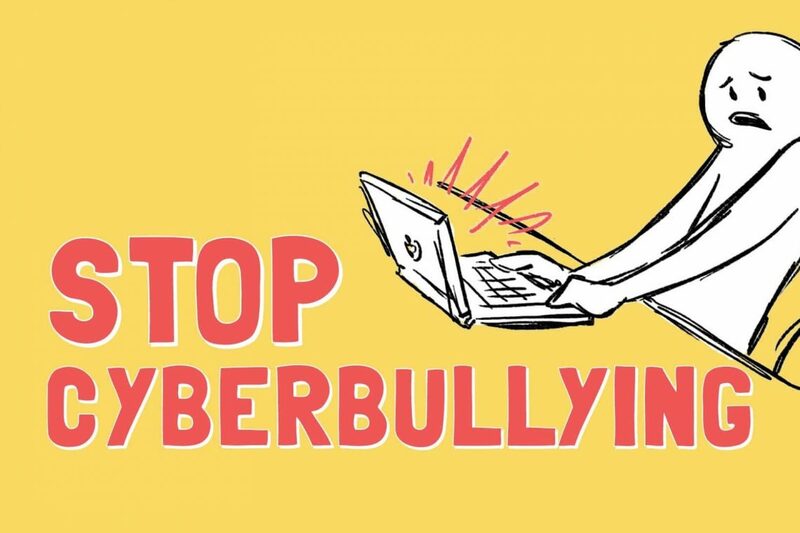 With it being Bully Prevention Month, we call on our Elected Officials, to stop the cyberbullying and intimidation they continue to project on the Johns Creek Post, and Publicly Apologize. If you are a victim of bullying and are struggling with your emotions and feel helpless, please know there is Help! Struggling with addiction and Bullying? More information can be found at this resource. Sources: City of Johns Creek, Facebook (screen captured by concerned readers), Cyberwise & Stomp Out Bullying. 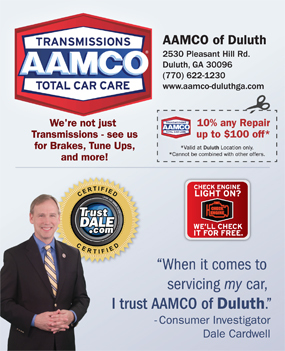 It is unconscionable that elected/appointed officials (or spouses) would publicly bully a local business. Bodker and his gang are unethical, narcissistic thugs. We can’t get rid of them fast enough. Hmmmmm… A person who has been defamed can sue the person who did the defaming for damages…especially if it has hurt your business. Our politicians had better mind: their “P’s and Q’s”. After all, the public has a right to criticize the people who govern them, so the least protection from defamation is given to public officials. Mike and Lenny need to put on their big boy pants. These two campaigned for this position, it sometimes comes with detractors. Instead of wanting to “Nail their butts to the wall”, don’t engage “anonymous”. Maybe these two haven’t done anything illegal, but at times have shown poor judgement and arrogance. I believe I have heard both of these guys promise that this would be their last term, if only Steve would join them. There is some good news. I can’t wait to vote these unethical people out of office. Mayor Bodker has proven how insecure he is by addressing negative posts about him. Why does he let this bother him? It’s part of holding a public office. If you can’t handle people that disagree with you or flat out don’t like you, it’s time for another job. The Mayor should spend less time worrying about his Facebook brand and more time working on his anger management issues.